Methanol ingestion is neurotoxic in humans due to its metabolites, formaldehyde and formic acid. Here, we compared the cytotoxicity of methanol and its metabolites on different types of cells. 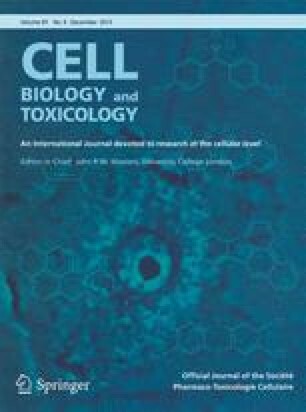 While methanol and formic acid did not affect the viability of the cells, formaldehyde (200–800 μg/mL) was strongly cytotoxic in all cell types tested. We investigated the effects of formaldehyde on oxidative stress, mitochondrial respiratory functions, and apoptosis on the sensitive neuronal SK-N-SH cells. Oxidative stress was induced after 2 h of formaldehyde exposure. Formaldehyde at a concentration of 400 μg/mL for 12 h of treatment greatly reduced cellular adenosine triphosphate (ATP) levels. Confocal microscopy indicated that the mitochondrial membrane potential (MMP) was dose-dependently reduced by formaldehyde. A marked and dose-dependent inhibition of mitochondrial respiratory enzymes, viz., NADH dehydrogenase (complex I), cytochrome c oxidase (complex IV), and oxidative stress-sensitive aconitase was also detected following treatment with formaldehyde. Furthermore, formaldehyde caused a concentration-dependent increase in nuclear fragmentation and in the activities of the apoptosis-initiator caspase-9 and apoptosis-effector caspase-3/-7, indicating apoptosis progression. Our data suggests that formaldehyde exerts strong cytotoxicity, at least in part, by inducing oxidative stress, mitochondrial dysfunction, and eventually apoptosis. Changes in mitochondrial respiratory function and oxidative stress by formaldehyde may therefore be critical in methanol-induced toxicity. This work was carried out with the support of “the Cooperative Research Program for Agriculture Science & Technology Development (Project No. PJ2015)”, Rural Development Administration, South Korea.